The main window is for loading loops and displays the currently selected waveform. After loading a loop, make sure it is selected using the [Sample Select] knob, and then check that the detected tempo is correct (it’s displayed in the box to the left of the sample window). If incorrect, the tempo can be adjusted using the slider bar beneath. If the correct tempo cannot be selected, then the loop is not an integer number of bars in length, in which case you cannot use it. All of the sampler controls in this section are stored per-pattern. Clicking a knob with the left mouse-button writes to the current pattern only, whereas clicking with the right-button writes to all eight patterns simultaneously (A to H). Also, double-clicking on a knob resets it to its default position. Displays the sample currently selected by [Sample Select]. Double-click to open REAKTOR’s Sample Map Editor and to load a sample file. Displays the automatically extracted tempo of the sample loop in beats per minute. Use the slider to select a different value. Selects a sample from the map within REAKTOR’s Sample Map Editor of the [Sample Display]. Calculates the pitch at which one bar of the audio file will be the same length as one bar of the actual current song tempo, and then transposes the loop accordingly. In other words when ‘stretched’, there will be no gaps between slices (caused by the original loop tempo being slower than the current tempo), nor will slices be prematurely truncated (caused by the original loop tempo being faster than the current tempo). It is still possible to transpose the loop when the stretch button is active, but obviously the loop will no longer be perfectly stretched to tempo. In other words, to be correctly stretched the pitch knob must be set to zero. Sets the hold period (i.e. the length) of the envelope shaping each slice’s amplitude. Sets the decay time of the envelope shaping each slice’s amplitude. This is the master control that can be varied for each step independently. Sets the output level for the current pattern. Things get more interesting here. L3 features eight parameters which can be sequenced by programming their value at each 16th. This is what turns old loops into new loops... The most obvious of these eight parameters is slice order. 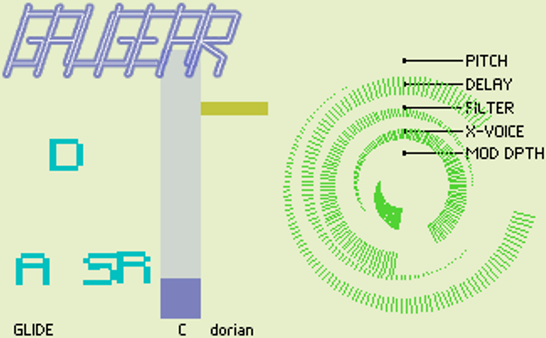 This is displayed in the lower of the two large windows (the [Slice Position Sequencer]). By clicking the mouse here you can rearrange slices of the original loop. The window is 16 steps high which means you can select the first 16 slices of your loop. If the selected loop has more than 16 steps, use the [Scroll Bar] at the left to see more slices. The right-mouse button has a function here too: it restores any step to its default value (i.e. to the original slice order). The upper window (the [Parameter Sequencer]) is for editing the remaining seven parame­ters: gain, pan, pitch, reverse, roll, attack, and decay. Clicking the right-mouse button re­sets steps to their default value. Controls the values of the various parameters for each sequencer step. Use the right mouse button to reset a parameter to its default value. Adjusts the pitch of each slice, i.e. its transposition in respect to the original pitch of the sample file. Determines the playback direction. At minimum (the default setting), slices will play forward as normal. At any other value they will play in reverse. At lower values, play­ back will start from near the end of the slice, whereas with higher values, playback will start from nearer the beginning of the slice. Causes the slice to retrigger repeatedly within each step. With higher values the slice will retrigger more quickly. Causes the loop volume to suddenly cut out and then fade back in. At maximum, the fade in time is exactly 1 beat (i.e. four steps). Controls the order of the slices. Low values represent slices at the beginning of the sample file, high values slices at its end. Thus, a line from the bottom-left to the top-right results in normal playback order as defined by the sample file without any re-arrangement. Scrolls the [Slice Position Sequencer] vertically. This can be useful if a long loop with many slices is loaded: As the [Slice Position Sequencer] can only display sixteen vertical values, slices after the sixteenth cannot be controlled. Use this bar to scroll to those higher values. Sets each step within the edit range to its default position. Shifts each step within the edit range up or down by one position. Rotates each step within the edit range to the left or right by one position. Resets all steps within the edit range in both the [Slice Position Sequencer] and the [Parameter Sequencer]. Copies all steps within the edit range of both the [Slice Position Sequencer] and the [Parameter Sequencer] into an internal buffer. Copies all steps from the internal buffer into the edit range of both the [Slice Position Sequencer] and the [Parameter Sequencer]. Each L3 snapshot consists of up to eight individual patterns labeled A through H. As you will see on the panel, there are 16 [Pattern Selector Boxes] along the top each displaying a letter (A to H). The pattern playback order depends on the arrangement of the letters dis­played in these 16 boxes. The leftmost box selects the pattern to be played for the first bar, the second box selects the pattern for the second bar, and so on. Controls the sequence of the patterns to be played one after another. Click and drag vertically on any of the 16 boxes to select a pattern. Use the [Loop Area Bar] to deter­mine the length and position of the loop. Defines the area of the [Pattern Selector Boxes] played in a loop. If only one box is selected, only this pattern will be played; this can be useful to edit and audition a pattern. Controls the number of beats in each bar. A beat is interpreted as a quarter note; each step represents a sixteenth note. Sets the amount of shuffle, i.e. the amount of slight delay on off-beats. L3 is a sequenced drum loop recycler: Load a loop, click some stuff, mangle the loop. The instrument’s panel can be broken down into three sections. The top section contains a pattern sequencer and global controls for pattern length and tempo swing. The middle sec­tion has the main step sequencer where patterns can be edited (up to eight patterns can be programmed and arranged per snapshot). 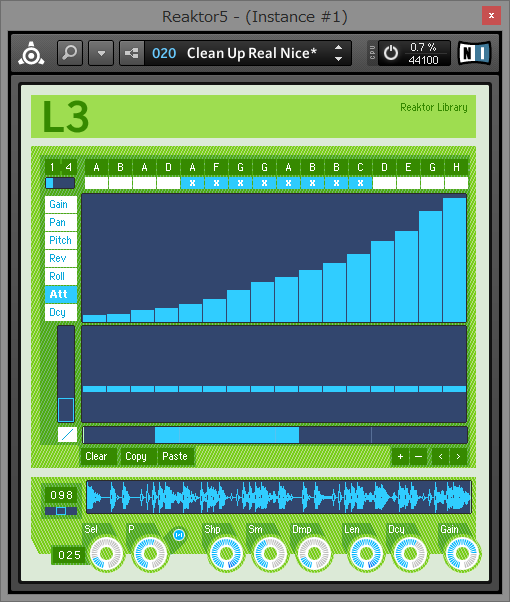 The lower section contains the sample play­ back engine controls (including the sampler window where loops are loaded). L3 is driven by the MIDI clock. This means that when used in the stand-alone version of REAKTOR, the play button on the REAKTOR toolbar must be pressed. 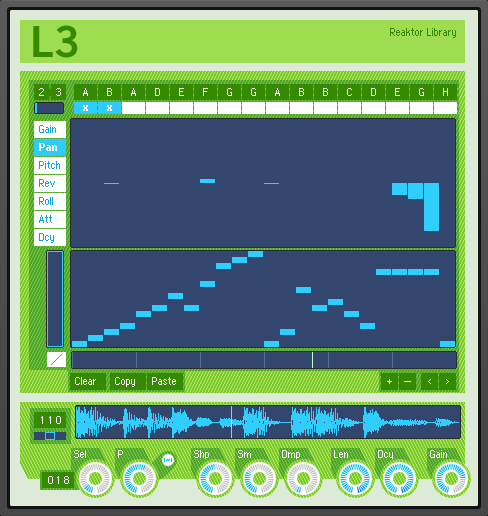 When used as a plug-in, L3 will only run when the host sequencer song is playing. Morphs through the oscillator settings. Each box’s position and color represents a set of parameters controlling one of the eight oscillators. The range of available settings is controlled by the circular controls of the Tone Generator like [Pitch] and [Filter]. 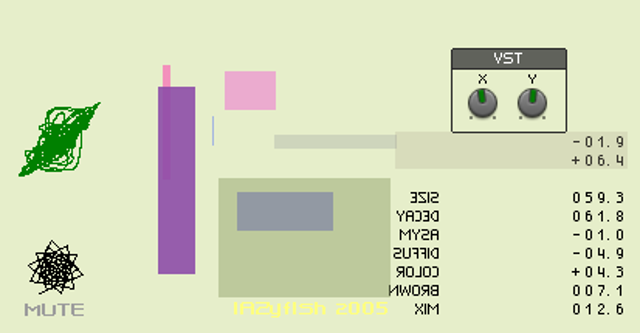 Each of its eight boxes represents one of the eight parallel oscillators; by moving the mouse within this area the boxes can be moved and their colors can be changed, visualizing a different set of values taken from the range of values provided by the circular controls. This sounds complicated; but a short tutorial will help using the instrument. Controls the amount of amplification or attenuation applied to the signal’s high frequencies. Controls the amount of amplification or attenuation applied to the signal’s low frequencies. Sets the size of the room simulated by the reverberation unit. Sets the time that passes until all reverberation signals have decayed. Places the signal to the left (negative values) or right (positive values) of the simulated room’s center. Sets the amount of diffusion applied to the room simulation. Crossfades between the unprocessed signal and the reverb signal. Gaugear is an experimental monophonic synthesizer: its sound explores sonic worlds that cannot be classified by MIDI pitches or a quantized clock, and its unique user interface invites new ways of sound design by omitting conventional knobs or faders. The basic structure of the instrument is simple to understand: The tone generator’s signal is shaped by an amplitude envelope and passed through reverb and equalizer. Controls the amount of pitch glide (portamento) that occurs when notes are tied. Selects the fundamental pitch of the scale selected by [Scale Select]. Selects a scale out of a vast range of pitch sets. The pitches of all oscillators are mapped to this scale. Controls the position and range of pitches available for the oscillator units (see also [Scale Select]). The left side provides high pitches; the right side, low pitches. Controls the position and range of delay times available for the oscillator units. The left side provides short delay times; the right side, long ones. Controls the position and range of cutoff frequencies available for the oscillator units’ lowpass filters. The left side provides high frequencies; the right side, low ones. Controls the routing of the modulation signals. Each oscillator’s pitch and amplitude is modulated by another oscillator’s output; this control defines the cross-modulation matrix. Controls the amount of modulation applied to the oscillators’ frequency and amplitude. The ring’s position adjusts the amount of FM (low FM values at the right side); its length adjusts the amount of AM (low AM values at short length settings).